A South Carolina state trooper was fired last week and arrested on Wednesday after a dashcam video showed him shooting an unarmed man during a routine traffic stop. 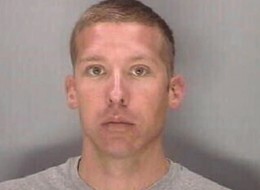 Former officer Sean Groubert, 31, is seen in the newly released video pulling over Levar Edward Jones. The clip, which was recorded on Groubert’s dashcam on Sept. 4, shows Jones getting out of his vehicle at a gas station in Columbia. When Jones complies and starts to back away from the vehicle, Groubert opens fire. Three shots can be heard; Jones was hit at least once, in the hip. Groubert was charged with assault and battery of a high and aggravated nature, a felony which carries a penalty of up to 20 years in prison, according to a news release from the South Carolina Law Enforcement Division. South Carolina Department of Public Safety Director Leroy Smith called the case disturbing. Groubert pleaded not guilty and is free after posting a $75,000 bond, according to WIS-TV. He’s expected to appear in court on Oct. 24. Jones was hospitalized for the hip injury, but has since been released. He told WIS that he hopes the incident will lead to change throughout the country.